Romaniascout – Romanian Energy News – Decrease in gas prices! In the recent years, the increase in gas prices was the only project proposed to Romanians. Accepting the real problems, in a professional manner, makes the decrease in gas prices to be the project to the attention of authorities. Consumers in Romania believe the price of gas to end-consumers is high. The fair appreciation of the size of gas prices can only be made by their free trading, in conditions of ensuring an adequate framework under the legislative, operational, financial, insurance aspect etc., in conditions of increasing the number of sources, suppliers and after learning the culture specific to free transactions by customers. In the past two decades, Romania suffered multiple transformations economically and socially, determining major changes in gas consumption, on supply and demand, on flow directions, on summer-winter/day-night consumption ratio, on the degree of use of systems etc. However, there was never a serious reconsideration of the gas sector, fair and scientifically substantiated. The existing approaches were circumstantial. However, the legislation imported and manufactured is incompatible with the reality in the field and insisting with its application is threatening. The intention to apply a new system over the old system, not restructured, the dualist position of authorities, the interest of those taking advantage from this situation created in Romania etc. make gas consumers in Romania to be certain victims. 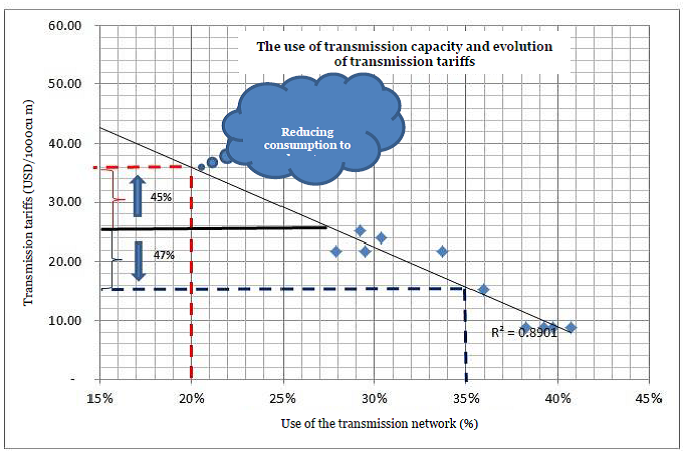 In a previous material I estimated that the situation of price increase as a result of domestic gas price deregulation schedule would determine a lower demand and it would cause, in turn, the increase in transmission, distribution and storage tariffs, in conditions of keeping the same situation as today. Recognition, acceptance and undertaking of this situation would determine the achievement of a strategy that would make order among actual problems in the field, which would allow a reduction in gas prices to end gas consumers, by reducing the costs of its components. understanding energy globalization and maximizing this trend for Romania. introducing new trade mechanisms in the transmission activity, in accordance with the legislation in force. 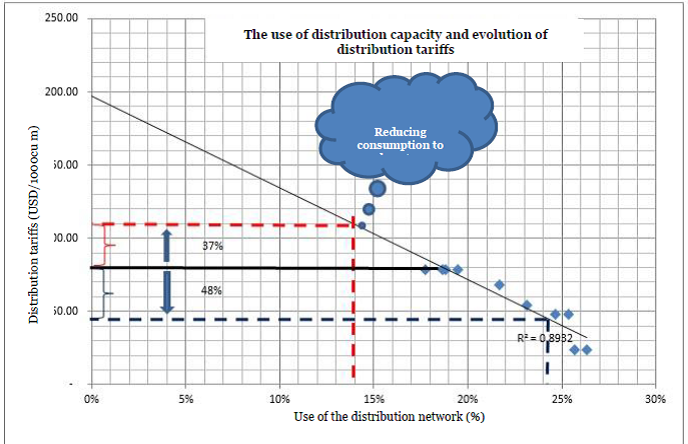 Halving the degree of use of the distribution network led to a doubling in distribution tariffs. 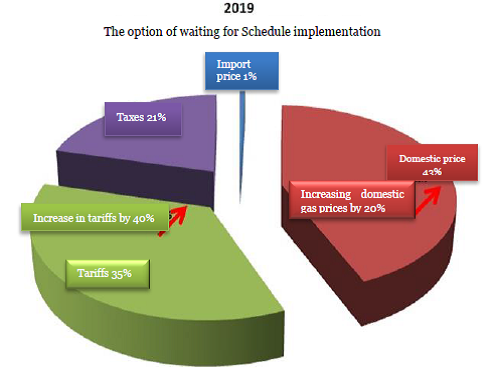 Costs in the distribution activity are relatively constant and slightly dependent on the distributed amount, thus the decrease in the distributed amount will determine the increase in the distribution tariff to obtain enough incomes to cover the existing costs. Developing strategic measures would allow the reduction of distribution tariffs by cutting costs and/or increasing revenues. 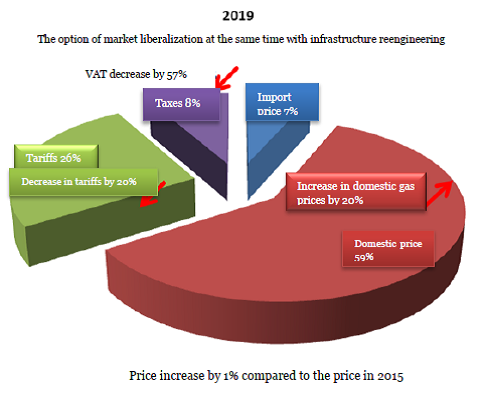 Together with measures in the transmission and distribution activities, the decrease in VAT from 24% to 9% for gas supplied would be likely to boost gas consumption and would reduce the impact created by the increase in domestic gas prices according to the deregulation schedule. Together with this measure, eliminating the excise duties, the tax on special constructions, the tax on pipeline etc. are elements that will allow the decrease in gas prices for end-consumers. Ensuring the functioning of the free market requires a number of measures that must be taken, implemented, monitored, corrected etc. I would start with the obligation for producers to set public commercial policies covering all market segments, so as to create a large number of initial transactions, to boost the increase in the number of market players, to have new transactions between them and thus competition starting to present its benefits, of getting the lowest price at a certain point. But, beyond this first measure, it’s necessary to create a functional, transparent system with a good traceability, inspiring trust and bringing and keeping new players in the market. They can all ensure the lowest price at a certain point in the market, because the illusion of a constant and low price is a LIE. I propose a project for cutting the costs of services, resulting in a decrease in gas prices to end-consumers. This scenario shows the difference between the strategic non-involvement of the state as entity with the role of ensuring an economic and social future of a country. Gas market liberalization can bring benefits for consumers, without waiting for the passage of time, but intervening and stimulating or restricting certain behaviors, attitudes and actions.